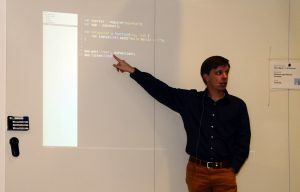 I have been using the force IDE for a couple of years while doing development on the force.com platform. I have seen the demos of and have sometimes used the developer console but we never really became friends. When I do development my tools needs to be super quick and I must be able to work offline and the developer console just doesn’t cut it for me (I love the watches / heap dump feature though). While the rest of the force.com platform has developed quickly the force.com IDE has more or less been standing still with no real changes done to it. 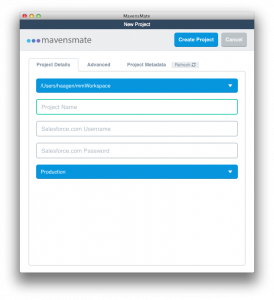 I was a bit surprised when I read about Salesforce limiting their support for the tool in favour of the developer console – this is also contradicting previous statements where some feature where promised to be developed for the IDE. By a pure coincident I stumbled upon the force.com plugin for Sublime which is called Mavens Mate. I am very happy that I did that. It’s an amazing tool that has speeded up my development a lot. I have in the past been pretty annoyed with Eclipse and never really enjoyed working with it. I find a lot of the features clunky and unintuitive. I wasn’t too impressed by sublime either when I first tested it but after looking at a short video course my eyes where opened and definitely think this is the tools to use — Mavens Mates is the deal breaker for me when it comes to Sublime and makes the workflow really smooth and fast. 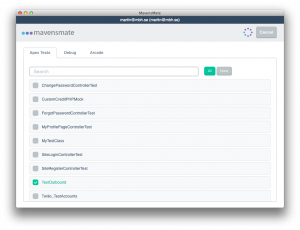 Mavens Mate works well on the three major platforms Mac, Windows and Linux. I tried them all and it works like a dream on a Mac and it’s obvious that this is the original environment for the tool. However it works well on Linux and Windows as well even though you might run into some minor issues. The major difference is that on Windows and Linux a browser (chrome) is used for the interface of the tool but there is a native interface for the Mac version. More templates when creating new meta data. When you create new classes or triggers you are given greater number of templates to use like Schedulable or EmailService classes. This jump-starts your development. With sublime you get the awesome integration to the console – you can reach all the feature and controls via keyboard shortcuts which means that you do not need to interrupt your work by moving your hands to the mouse to do something. This makes the development environment really quick and easy to work with. Beautiful interface that works very well. A little extra is the “Arcade” function that you can use while you are deploying or running test methods. In bigger Salesforce instances this can take quite some time so meanwhile you can play a game of Pacman or Tetris. Another feature that is on it’s way is the Debug watches / breakpoints. I wasn’t able to get it to work on either of my machines but when this works this combination of tools has surpassed the abilities of the Force.com IDE with miles. 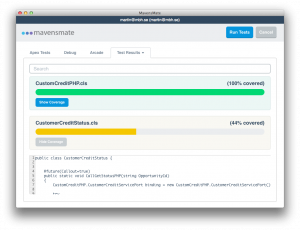 To sum up using Mavens Mate as a plugin to Sublime is a great combination and will give you are fast and smooth development environment.